In White House Run, Herman Cain Counts On Corporate Skill Herman Cain is the only Republican presidential contender who's never held political office. Critics say that could be a disadvantage. Cain and his supporters say his business experience is an asset. Herman Cain grew up in Atlanta, graduated from Morehouse College and worked briefly for the Navy. He got a master's degree in computer science and worked in that field at Coca-Cola for a while. But, as Cain writes in his latest book, This Is Herman Cain! : My Journey to the White House, both he and his father realized he would not move up at Coke, where his dad had been a chauffeur. Cain knew, he writes, "that as long as I remained there I was always going to be viewed in that predominantly white corporate culture as his son." So Cain left Coke for the Pillsbury Co., where he became a corporate vice president. The position lost its sparkle after a few years, he says, so he decided to leave his comfortable corner office for a job at Burger King. Cain participated in a management training program and began working as a manager at one of the chain's restaurants. He recalls that one day the broiler was accidentally turned off, leaving raw patties and huge lines at the counter. "We had no burgers at Burger King," he says in his book, recalling that he told the staff to make all the chicken and fish sandwiches they could — and then he took matters into his own hands. "I went to the front of the restaurant and informed the customers that it would be fifteen minutes before we would again be serving burgers and Whoppers," he writes. "Then I went outside, going from car to car to explain the situation." That's how Cain says he made it through his first crisis at Burger King. 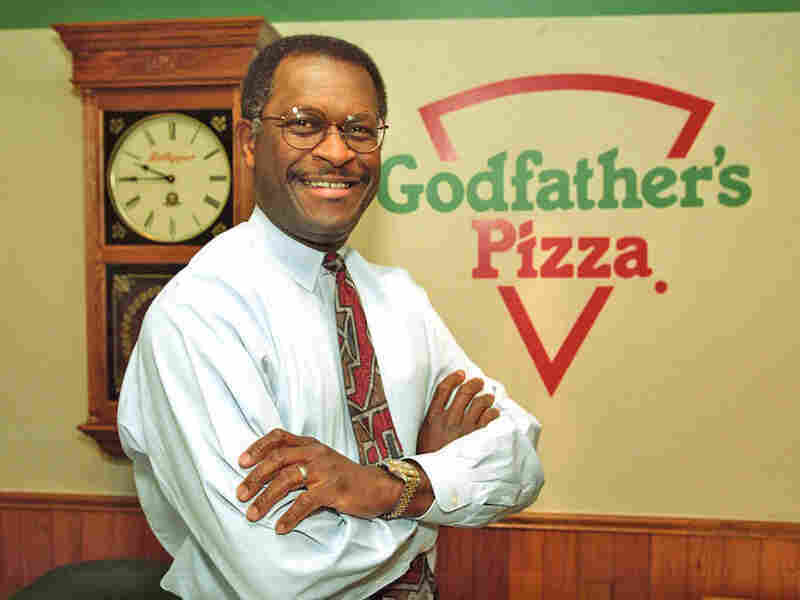 After working his way up to vice president there, Cain turned to Godfather's Pizza, a once profitable chain that was fading fast in the 1980s. The chain needed new leadership. In 1985, when Pillsbury acquired Godfather's, Jeff Campbell, the head of Pillsbury's restaurant group, called on Cain to take over the next year. "There wasn't a whole lot of question in my mind who should go in there," Campbell says. Cain was perfect for the job because at Burger King, Cain learned to persuade franchisees to do what he wanted, and he acquired lots of skills that translate well to politics. "Ability to think on your feet, ability to convince others, ability to energize and inspire your own people, and ability to make decisions under stress," says Campbell. "And so people can make all the fun they want of the fact that he used to run a pizza company, but most of the people he's running against couldn't have done it." A Businessman In The White House? Cain is credited with turning around Godfather's and keeping it out of bankruptcy. He eventually bought the company and became CEO. He is a risk-taker — even fearless at times. That's clear from a 1991 performance that recently surfaced of Cain, dressed in a white gospel robe, hamming it up to his version of John Lennon's "Imagine." Cain shows off his vocal ability often, singing at the Iowa straw poll and recently at a campaign stop in Tennessee. His goal, in part, is to attract disillusioned voters — and many are taking a serious look. At a truck stop some 35 miles west of Atlanta, in Villa Rica, Ga., sits the only Godfather's Pizza in the state. People here know Cain, who hosted a radio talk show for many years in Atlanta. Born: Dec. 13, 1945, in Memphis, Tenn.
"Well, I'll put it to you this way: He is the only presidential candidate I've ever sent money to," says Joe Douglas, who teaches biology at the University of West Georgia. "I love his no-nonsense approach, and I think a good businessman is who we need in the White House." But some analysts say Cain's lack of political experience could be a real disadvantage. Emory University political science professor Merle Black says that in business, you can fire people; in politics, you're forced to work with them. "It's very, very different," says Black. "A chief executive in the White House is not analogous to a chief executive in a business corporation. So a lot of times individuals who had experience in business become totally frustrated when they get into politics, because it's not the same situation at all." But in an interview with NPR earlier this year, Cain said he likes being the outsider. "The people that I'm talking to, the regular folk, they don't care that I've never held public office," he said. "They see that as a plus. They see me as the people's candidate." Cain knows some have dismissed his candidacy. But as he sees it, there are similarities between Godfather's and the failing economy. Given the chance, Cain says his 9-9-9 tax reform plan and his business experience could help turn things around.